Tomato Basil Bisque with Italian Meatballs is an easy, smooth, rich soup bisque recipe for a comforting fall dinner idea! This Tomato Basil Bisque with Italian Meatballs is easily the best thing I’ve made in a long time. I rarely compliment my own cooking, but this one deserves a little gloating, kind of like my Broccoli Cheddar Soup. Soup and bisque season is one of my favorite times. There are so many good soup recipes on my blog. 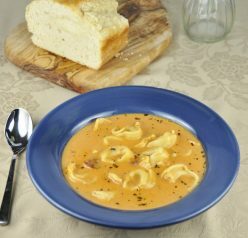 I could eat soup every single day and be as happy as a clam – even in the summer! I’m addicted to my Copycat Panera Chicken & Wild Rice Soup. In the fall and winter months there is just something so comforting about eating a giant bowl of warm soup. I also make this 20 Minute Cheesy Chicken Enchilada Soup on a regular basis. Many of you may have seen if you follow me on social media (specifically Instagram) that Mr. Wishes and I took the baby on her first vacation. The trip was very “different” to say the least, but a lot of fun. I was very anxious leading up to leaving on the trip. Packing for Mexico was a job in itself. I can’t believe how much a 4 month old baby this small needs! Normally I just throw my whole closet in my suitcase and call it a day, but since I was sharing a suitcase with her this time, I had to actually plan out my outfits ahead of time (and bring way less pairs of shoes). First world problems! The trip went well despite my super high anxiety. She did GREAT on 4 out of 5 flights and spend most of her time eating or sleeping while in the air. God bless the built-in white noise that comes from sitting right next to the engines. We did resort to Mickey’s Clubhouse once or twice on the TV screen (parenting fail). The nightmare flight was the last and final stretch from NYC to Rochester. She screamed for the entire 45 minute flight! Nothing we did made her happy. An overtired baby is a baby you don’t want on the plane with you, whether you are the parents or an innocent bystander. It could have been worse as it was a short flight (that seemed like 5 hours with a screaming baby). Overall, I can’t complain. She officially has her first passport stamp and I was super proud of myself for doing the trip. 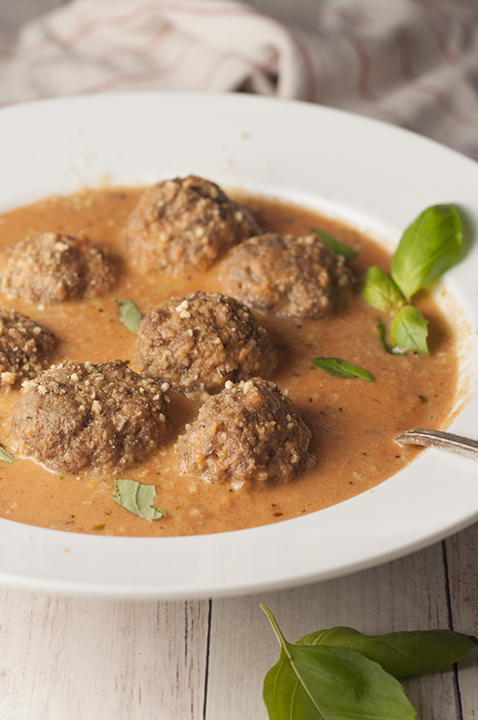 A soup with meatballs in it is pretty much my dream come true. This tomato basil bisque is thick, creamy, and restaurant-quality. I might even try adding orzo next time to make it extra hearty like this Chicken Orzo Stew that I love. For another great soup for fall, check out my Hearty Chicken Pumpkin Soup! 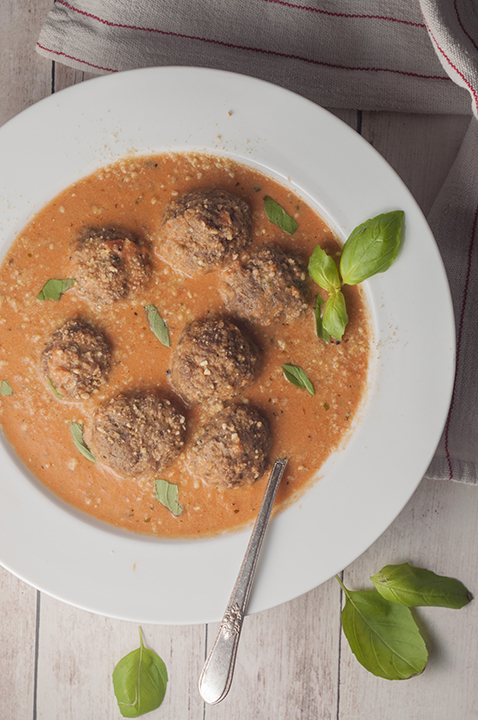 Tomato Basil Bisque with Italian Meatballs is a smooth, rich bisque recipe for a comforting fall dinner idea! 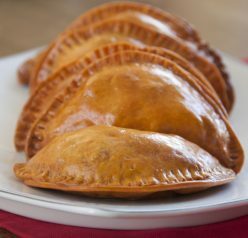 Combine the ground beef, garlic powder, breadcrumbs, dried oregano, onion powder, mustard powder, salt, and pepper. Form the meat into small meatballs with your hands. 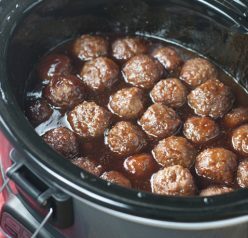 Place the uncooked meatballs on a baking sheet and place into the oven to cook for 12-15 minutes. Pour the olive oil, tomatoes (with juice), fresh basil, and coconut milk into a blender. Blend until you reach the desired consistency you prefer. I like it to be nice and smooth. Pour the tomato basil bisque back into the saucepan and turn heat to low, just to warm throughout. 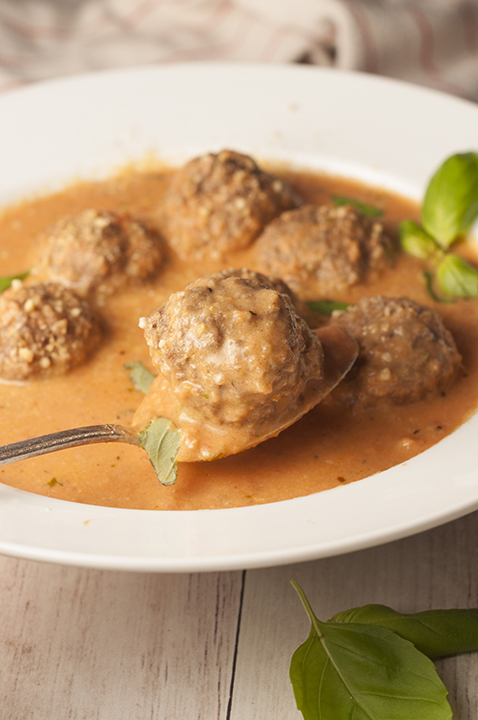 Once the meatballs are finished cooking, add them to the bisque. Serve with grated parmesan or pecorino cheese on top, if desired. Sprinkle some fresh basil on top (optional). Enjoy! Such a good meal to warm up with! So cozy! Comforting is right. This recipe is absolutely delicious and hearty. This is SO rich and delicious! I love the addition of the meatballs. It makes this a whole meal! Love the pack of protein in this soup- yum! Is there a substitute for the coconut milk? We have an allergy to coconut in the family, but I’d love to make this if there’s a substitute. Oh my! Love everything about this! Meatballs are one of my favorite things.